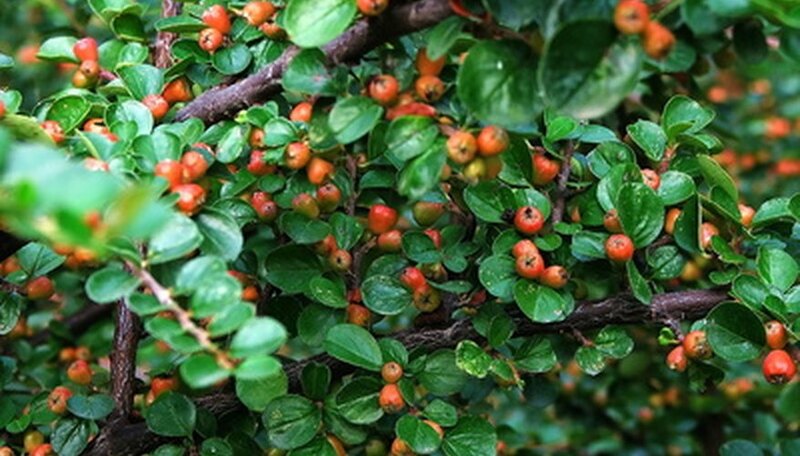 Common barberry, or Berberis vulgaris, is a hardy 8- to 10-foot flowering bush favored by landscapers for its fall foliage and yellow flowers that turn into red berries in the winter. These berries are then used for jelly or pickling. To enjoy the vibrant burst of color a barberry bush has to offer, you can grow your own from a clipping taken from the parent plant in late spring or summer through early fall. Wash your pruning shears thoroughly in hot soapy water and disinfect them by pouring alcohol solution over them. Allow them to dry thoroughly before using them. This is essential to prevent spreading any disease to the bush. Cut a young, healthy, 4- to 7-inch stem that is less than a year old from the parent barberry bush. Remove any flowers or foliage from the lower one-third of the stem length. This helps focus energy on root growth as opposed to strengthening flowers or foliage. Add rooting hormone to a small cup and insert the cut end of the stem into it. Completely cover the stem in the hormone before tapping it gently to remove any excess. Dispose of the rooting hormone instead of pouring it back into the container, as it could spread disease. Fill a 4-inch-wide pot with equal parts peat moss and sand and insert 2 to 3 inches of the cutting into it. Fill a rooting tray with peat moss and sand if you are rooting more than one barberry cutting, and space them 4 inches apart so that the leaves do not touch. Water the pot until the potting medium is evenly moist. Place a saucer or flat under the pot to collect drained water and prevent a mess, and place the pot in indirect sunlight. Insert four to five equally spaced thin sticks along the outer edge of the pot. Make sure they are several inches taller than the cutting. Spread a clear plastic bag over the pot, supporting it over the sticks to keep it off the cutting. This creates a greenhouse effect to keep the soil moist and temperature humid, which promotes root growth. Mist the cutting frequently. Tug on the cutting five to six weeks after potting it, to test for resistance from growing roots. Transplant the cutting to a larger pot filled with good-quality potting soil when roots poke through drainage holes. Grow the cutting in a protected environment for a year before transplanting it to its final location outside. Make sure the pot has adequate drainage holes in the base so that the plant does not develop root rot.